On September 13, 2016, the U.S. Securities and Exchange Commission (“SEC”) filed a complaint in court charging a company named Wealthpire, Inc., and its owner with investment newsletter fraud. That same day, the SEC issued a press release announcing that Wealthpire and its owner agreed to settle the investment newsletter fraud charges and other charges for approximately $1.5 million. According to the SEC, Wealthpire deceived its paying and potential subscribers by providing false information regarding stock trades and performance. To make the investment newsletter fraud seem believable, Wealthpire’s owner, Manuel E. Jesus, claimed to be Manny Backus. According to the SEC’s court complaint, Jesus pretended that his fictional Backus persona was a “whiz-kid”. In advertisements and through websites, Jesus fostered the Backus image by marketing himself as a “math wiz” with a “skyscraping” IQ. He claimed that Backus had become “the untutored prodigy of stock investing”, having parlayed his skills as a professional chess player into stock-picking success that began with active securities trading by the age of 19. Jesus’s investment service, Wealthpire, also made claims that “Backus” had made millions of dollars investing his own money, before starting an investment alert service that would let traders copy his trades in order “to help other investors”. The SEC also alleged that Wealthpire furthered the investment newsletter fraud by lying to its subscribers about who was making the investments and in what securities. As part of the investment newsletter fraud, Wealthpire recommended one set of investment trades to its subscribers. At the same time, through e-mail alerts, chat rooms, or other promotional activities, Jesus/Backus was trading or investing in different securities. Furthermore, Jesus often was not even the trader making the recommendations. 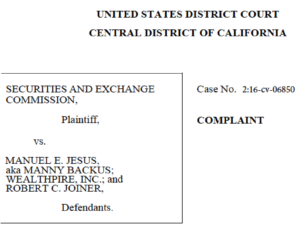 According to the SEC, Wealthpire paid a third individual, Robert C. Joiner, to pose as Backus for one of its alert services, to make the stock picks for that “alert service”, and to participate in chat room sessions pretending to be Backus. In those chat room sessions, using the Backus alias, Joiner claimed to be buying and selling certain stocks when in truth Backus/Jesus was not actually doing so. The SEC has previously warned investors to be critical of claims made by investment newsletters and stock picking alerts, especially unknown services that claim to have achieved exceptionally high returns and that do not receive commissions for their advisory recommendations. $235,000 in penalties paid by Jesus a/k/a Backus. Additionally, Jesus/Backus, Joiner, and Wealthpire consented to the entry of a final judgment permanently enjoining each of them from future violations of the antifraud provisions of the federal securities laws. However, the SEC has not made any public statement as to whether this case was itself an actual SEC whistleblower case. The SEC Office of the Whistleblower posts Notices of Covered Action (“NoCA”) for Commission actions where a final judgment or order results in monetary sanctions exceeding $1 million. But the SEC does not disclose if a particular Enforcement action on the NoCA list was brought as the result of an SEC whistleblower case, tip, complaint, or referral being filed with the Commission.